TotalBiscuit the Steamwork Kumos has won the Pet Spotlight! That's a great tribute pet really! 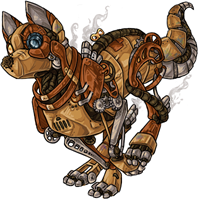 This is a fantastic tribute pet, good show! That's good stuff; an excellent tribute! definitely miss TB, hope he's resting easy. Rest in peace, TB. What a great tribute pet. Congratulations Camilla! What a lovely lovely pet. R.I.P, TB, you brought me a lot of joy when I was in a dark place. RIP TB. You were a great man. A lovely tribute ;n;, congrats on the win! OMG a wonderful tribute pet!